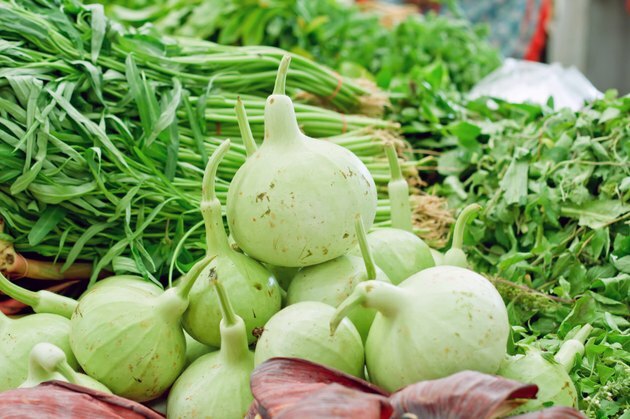 Some varieties of lauki, also called bottle gourd or calabash gourd, can be used as a vegetable, but others have a bitter taste and may be dangerous -- or even lethal -- to consume. Lauki is part of the cucumber family and grows in many of the warmer areas of the world, including in some parts of the United States, such as Florida. The variety that is long and narrow is best for eating, and those that are club-shaped or round are best for making containers. Very little evidence links lauki juice to weight loss and the study used animals as subjects, not humans. Check with your doctor before drinking lauki juice, as it may not be safe for you. There isn't a lot of scientific evidence to support the use of lauki for weight loss, and what does exist is very preliminary. An animal study published in the Asian Pacific Journal of Tropical Medicine in September 2012 found that lauki helped to minimize weight gain in rats fed a high-fat diet. Further research is necessary to verify that the same occurs in people. In general, it's better to eat a fruit or vegetable itself instead of just its juice if you're trying to lose weight. The juice won't have the fiber of the lauki and will be higher in calories per serving. You can eat a whole cup of boiled lauki for just 19 calories, and it will provide you with almost 2 grams of fiber. It takes multiple cups of lauki to produce a serving of juice, which means the caloric content is also multiplied. The high water and fiber content of lauki make it very low in energy density, or calories per gram. A review article published in the Journal of the Academy of Nutrition and Dietetics in May 2012 noted that diets lower in energy density may be helpful for losing weight and maintaining weight loss. Lauki can have a diuretic effect, which may be at least part of the reason why it's sometimes recommended for weight loss. People sometimes take diuretics in an effort to lose weight, but this isn't a healthy practice. It isn't an effective way to lose weight, either, because what is lost is mainly water weight, not fat. Once you stop using diuretics, any weight lost is likely to come right back. Taking diuretics unnecessarily can also be risky, potentially leading to dehydration and electrolyte imbalances. There are a number of reports of adverse effects from drinking lauki juice, including bleeding stomachs, nausea, ulcers, diarrhea, vomiting blood, abdominal pain, liver or kidney problems and even death. To limit this risk, drink only lauki juice that has been cooked, and don't drink any lauki juice that tastes bitter. The bitter taste comes from the cucurbitacin compounds in lauki that are toxic to people; however, the compounds can be deactivated by cooking. Those that taste bitter should be discarded and not eaten or used to make juice.The safe varieties of the gourd should taste slightly sweet and be tender. Even then, it's best to drink no more than about 3 ounces per day, recommends an article published in the International Journal of Nutrition, Pharmacology, Neurological Diseases in 2012. Given these risks, it may be best to skip lauki juice and choose other types of beverages as part of your weight loss plan. Instead of looking for a weight-loss miracle food, stick with the tried-and-true method of losing weight -- eating less and moving more. Eating 3,500 fewer calories per week, or 500 fewer per day, will lead to 1 pound of weight loss per week. Eat mainly whole foods like lean protein, healthy fats, fruits and vegetables -- including a small amount of cooked lauki if you'd like -- and minimize processed foods and those high in sugar or fat. Add exercise to help increase your calorie deficit and lose weight more quickly. This will also help make sure you are losing mainly fat and not muscle. Exercise 150 to 300 minutes per week at a moderate intensity level, and do strength-training exercises at least twice a week for the most weight-loss benefits. University of Florida Extension: Gourd, Bottle -- Lagenaria Siceraria (Mol.) Standl. International Journal of Nutrition, Pharmacology, Neurological Diseases: Bitter Bottle Gourd (Lagenaria Siceraria): Healer or Killer? Can I Eat Beets Without Cooking Them?